Largest Mountain Chain in the world. Found in Western South America. The Andes Mountains is located in South America. It runs north to south along the western coast of South America. These mountain ranges are the longest chain of mountains in the world. They are also one of the highest, elevation wise. The Andes Mountains extend 4,500 miles (north to south). The mountains are divided into three essential regions: The Southern, Central, and Northern regions. Plants that grow in the Andes Mountains are small in size to conserve energy. There is also a large variety of animals in the Andes Mountains. Humans are hurting these mountains everyday due to tearing down trees and mining for Gold, Silver, and Copper. Hotter region due to being closer to the equater. Most rainforests are located in this region. Its climate is usually humid and rainy. Just as a rainforest should be. The Southern region is closer to the Antartic. It is much colder. It has a very low population due to its climate type. The climate is not suitable for animals or plant life. The Central region is in the middle of the Northern and Southern Regions. Its climate is mild so its not too hot or too cold. A little fun fact about this region is that it grows the largest herb in the world, click. An Alpaca is a species from the Llama. 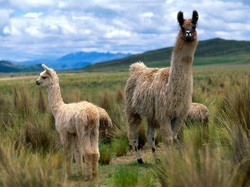 The Alpaca is a very common animal you'll find in the Andes Mountains. To describe an Alpaca is that they have small heads, a cleft upper lip, and pointed ears. Alpacas have skinny bodies and long necks. They have 22 shades of coat colors. They are herbivores which means they only eat plants and leaves. They have domesticated for over 5,000 years. The Alpaca is prey to Pumas, Leopards, and other species that live in the Andes Mountains.